The Philippine Navy’s BRP Tarlac (LD-601), the first ever Strategic Sealift Vessel (SSV), arrives at the South Harbor in Manila, May 16, 2016. 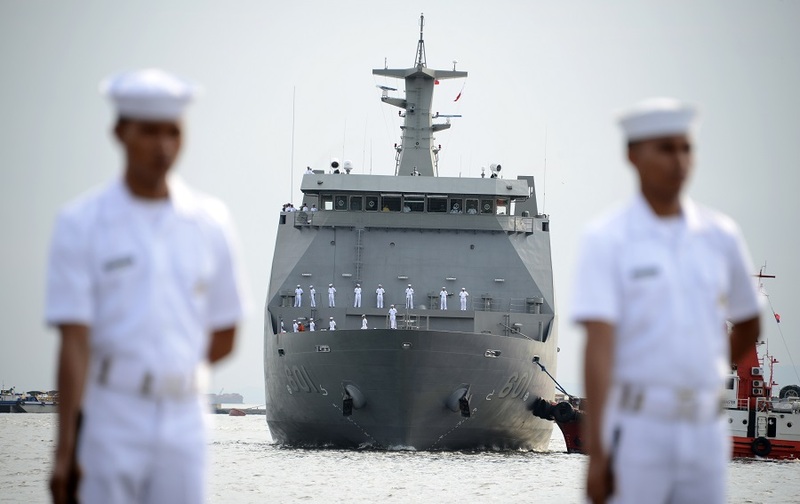 The BRP Tarlac will serve as the Philippine Navy’s floating command and control ship as the country modernizes its fleet amid tensions in the South China Sea. A ruling from The Hague next week on maritime disputes in the South China Sea is likely to exacerbate frictions between China and the U.S. Both would be better off respecting the central role of the Association of Southeast Asian Nations (ASEAN). Expecting an unfavorable decision by the Permanent Court of Arbitration on the Philippines’ challenge to its extensive maritime claims, China has intensified its long-held policy of divide-and-rule to prevent ASEAN from closing ranks behind the legal process. At a meeting in Kunming last month, Beijing managed to force the ten members of ASEAN to recall a jointly agreed statement which expressed “serious concerns over recent and ongoing developments, which have eroded trust and confidence” in the South China Sea. According to several Southeast Asian diplomats, a Chinese vice foreign minister delivered a stern lecture warning ASEAN against uniting behind the arbitration verdict. But the brass-knuckled approach backfired. The Foreign Ministers in the audience, some ranking at the Deputy Prime Minister level, saw the act as a serious breach of diplomatic protocol and an insult. Several of them, including those from countries normally sympathetic to Beijing, responded with sharp words, said diplomats there at the time. A planned joint press conference ended up with China performing solo. Despite Beijing’s protestation of a robust win-win partnership unaffected by the South China Sea, the debacle in Kunming made clear that its relations with ASEAN are at their lowest point in years. China has managed to use its regional economic supremacy to keep Southeast Asia on a short leash, a job that has been made easier by ASEAN’s internal divisions. Beijing’s undermining of ASEAN unity, however, has unintended consequences. Diplomats and analysts from key ASEAN members expressed concerns about not only China’s assertiveness in the South China Sea, but also about whether it hopes to dismantle the regional body. A shared sense of insecurity might end up lending ASEAN a coherence that it has failed to achieve through shared economic prosperity or geographic proximity. The true test will come when ASEAN foreign ministers meet in Laos, days after the arbitral tribunal’s ruling. Cambodia’s president has said he “will not support any judgment by the court,” sparkling nervousness among other Southeast Asian nations that Cambodia may again block an ASEAN common position, much like it did in Phnom Penh in 2012. That year, ASEAN’s foreign ministers ended their meeting without issuing a joint communiqué for the first time in the group’s 45-year history. A weakened ASEAN would skew the power asymmetry further in Beijing’s favor in South China Sea negotiations, but could undermine China’s broader strategic interests. Losing confidence in China’s sincerity or ASEAN’s ability to achieve equitable outcomes through diplomacy, many Southeast Asian nations are already making more room for Washington and could follow Manila’s footsteps to seek legal recourse. The Philippines, Singapore, and Vietnam have already enhanced their military ties with the U.S. A few others have quietly sought Washington’s assurances that the U.S. will act as a lasting and credible security presence. Even so, the U.S. has to walk a fine line. Southeast Asia wants the U.S. to provide a backstop for the region’s peace and stability, but also frets that Washington could go too far and provoke Beijing into a superpower showdown that ends up crushing smaller states. America’s power is welcome when it supports but does not replace ASEAN’s leadership in regional governance. The reception will turn cold if Washington is suspected of using the South China Sea to stage a struggle for supremacy with an emerging rival at the cost of Southeast Asia or to pursue military alliances without regard for ASEAN’s unity. Washington’s unilateral display of naval power, a popular call in the U.S., can send a message of deterrence, but there are regional worries that it may also goad China into doubling down on the militarization of the South China Sea. It will take painstaking multilateral diplomacy to persuade China to commit to negotiations with ASEAN to find a rules-based solution. Washington’s military maneuvers and bilateral security arrangements have to be matched by efforts to shore up ASEAN’s capacity. ASEAN has yet to develop the ability to lead on the South China Sea. Its members, all of whom display a prickly nationalism to a greater or lesser degree, are unwilling to delegate enough power for the organization to take the driver’s seat. The result has been paralysis. The group’s risk aversion and bureaucratic inertia have let negotiations with China on a Code of Conduct, which would commit all parties to behavior agreed on by consensus, drag on for decades, producing a long parade of empty commitments and little substance. But both superpowers would be making a mistake to underestimate ASEAN nations’ will to preserve the institution and its ideal: it gives its small and mostly underdeveloped members a chance to speak as equals with outside powers. Frustrating and at times ineffectual as it is, ASEAN has been at the forefront of Southeast Asia’s progress in economic integration, trust building, and governance by consensus. Its undoing would drive regional states to seek security through destabilizing arms races, bandwagoning, and offshore balancing. China and the U.S. are unlikely to see eye to eye on most issues in the South China Sea any time soon, but both would be better off preserving ASEAN’s centrality in managing the thorny disputes. The alternative is a fractured region caught between two superpowers inching closer with bare knuckles.